Consuming tobacco in any form affects oral health in many ways. It causes cracked lips, mouth sores, discoloration on lips and teeth, bad breath, and oral cancer. 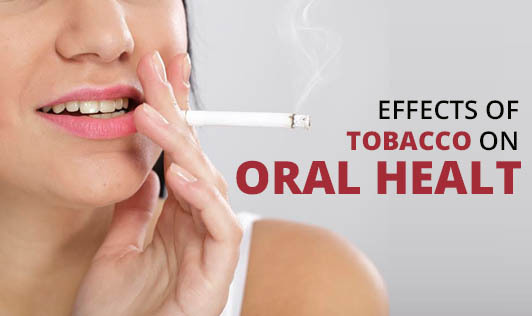 Read on to know how smoking or tobacco chewing affects your oral health. Doctors of Indian Dental Association say that tobacco interferes with the normal functioning of the gum's tissue cells. This interference makes tobacco users more susceptible to oral infections and tooth decay. Repeated exposure of the mouth and throat to smoke and carcinogens irritates gum tissues and damages teeth completely. This exposes the roots and causes sensitivity. Prolonged exposure to tobacco can also lead to oral cancers. There are many toothpastes available in the market for tobacco users to get rid of stains caused by tobacco. However, these toothpastes are highly abrasive in nature and can cause damage to the enamel. Dentists of IDA say that it is important for smokers to quit smoking to experience improvement in oral health. They also say that the first signs of tobacco affecting the body can be seen in the smoker's mouth. Exposing oral cavity to even small amounts of tobacco should be avoided for good oral health. Quitting tobacco may lead to stomach disturbances, headache, insomnia, and irritability. Nicotine replacement therapy can help overcome withdrawal symptoms. Consult your doctor to learn about safe nicotine products that suits you best when you plan to quit smoking.